TSIC is constantly trying to take up initiatives that would bring together the ecosystem and help the startups in their growth. One such initiative is the Speaker Series, where they invite eminent VCs visiting Hyderabad to share their knowledge with the startups and other ecosystem players. The Speaker Series provides a platform for visiting VCs based out of Hyderabad to interact with startups at a larger scale and provides a chance for startups to understand different perspectives that are involved in building a business and raising funds. The first Speaker as part of this VC Speaker Series was Pranav Pai, Founding Partner, 3one4 Capital who interacted with startup founders and shared his learnings with respect to early-stage startups. The second speaker and for the month of November was Sunil Rao of Lightspeed India. The VC Speaker for the month of March is Radhesh Kanumury, CEO & Managing Partner, ARKA Venture Labs. Arka Venture Labs is the first platform of its kind to assist the foray of Indian B2B startups into the US. They do it not just by providing capital but also hands-on mentorship and infrastructure. This is the first platform to give Indian startups access to the Silicon Valley ecosystem. 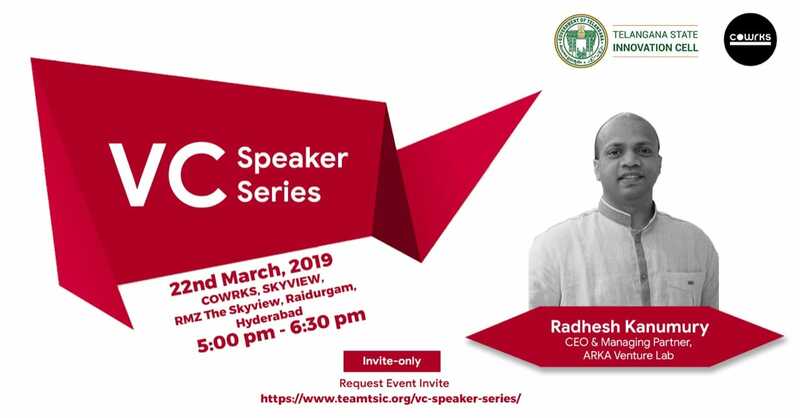 Attend the VC Speaker Series to interact with Mr. Radhesh Kanumury and learn more about funding and building your company where he is all set to interact with Hyderabad startup ecosystem on 22nd March (Friday) from 5:00 PM onwards.